Today’s March is for Making inspiration (30 #makered inspirations in 30 days) came from a big AHA that I had at the SxSwEDU conference last week during Katie Krummeck’s session on Maker Based Instruction. Towards the end of our session, one of the participants shared how he struggled with the feelings that he has when all learners don’t end up with a beautiful product at the end. 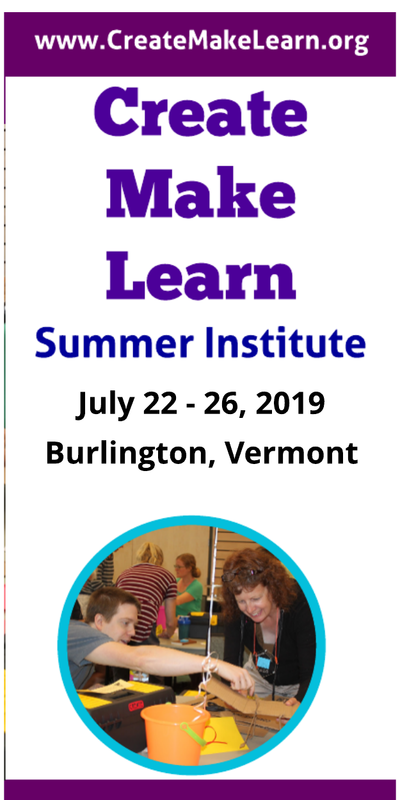 Katie shared that it might be helpful to have different rubrics to put the focus on different goals for different types of makes. One rubric might put a focus on the DESIGN process, another might put a focus on AFFECTIVE skills, and another on CRAFTSMANSHIP. Sometimes you need more risk taking and more ideas and possibilities. 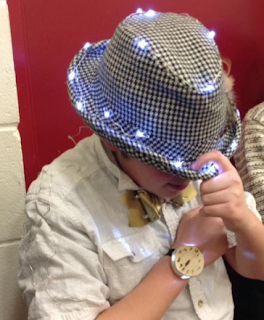 Sometimes you need to spotlight the process of collaborating, perseverance, self direction! She explained that if you are looking for high resolution, you’re most likely going to see less risk taking. Thinking about what the goals are will determine which rubric you are going to use. 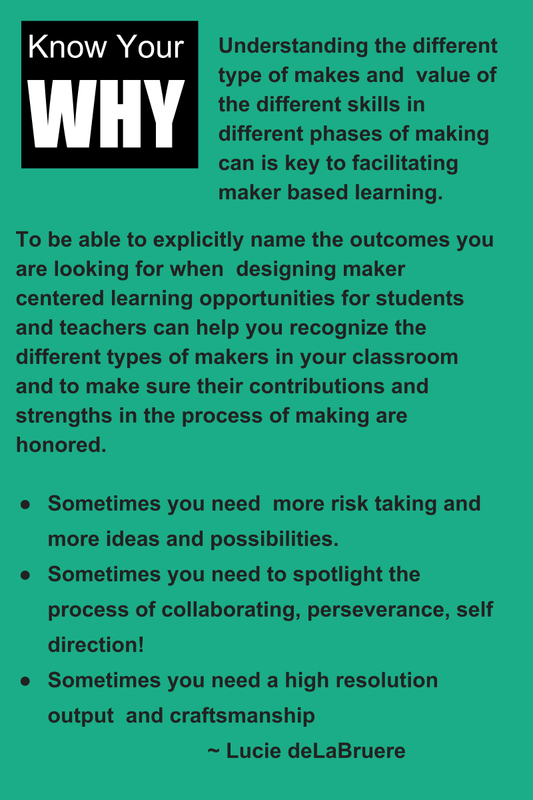 Even though I'm not a big fan of rubrics, I could see how they could be used to honor different types of maker skills. I cannot tell you how much her advice impacted me as a maker educator. 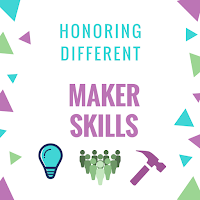 Sometimes when I’m around my maker friends who shine at craftsmanship, I start feeling that I don’t belong in this group who calls themselves Maker Educators. I usually work out those feelings, but they always come back when I’m surrounded by the amazing craftsmanship of some of my maker friends. Katie’s words helped me more clearly identify which maker skills I bring to the table and to honor those skills. 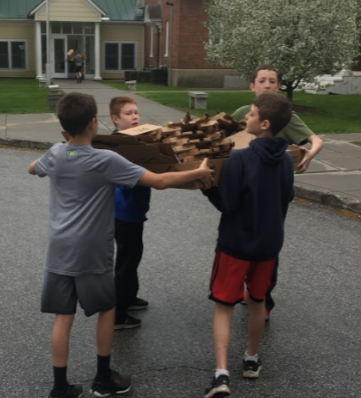 It made me wonder how we as educators could help our students notice the skills they bring and to honor those strengths during the process of creating, making, and learning. I created this graphic to help me name three different areas where a maker might excel in. Are you the person who can generate a gazillion ideas? 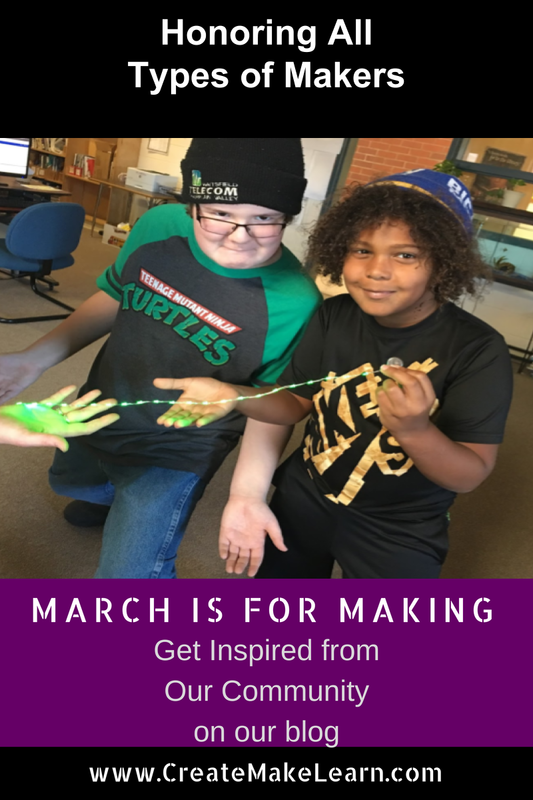 If you excel at imagining the possibilities, brainstorming, combining ideas from different disciplines in creative ways that nobody else sees, you will probably shine during the earlier stages of the maker process. Here's when a rubric that shines the light on your ability to design new solutions and take risks can honor your contributions. When inventive thinking and creative problem solving are key, everyone will want you on their team. But we know that all those good ideas do no good if nobody reigns them in and organizes the process and all the people who will bring amazing ideas to fruition. Affective skills are key during this part of the making process. 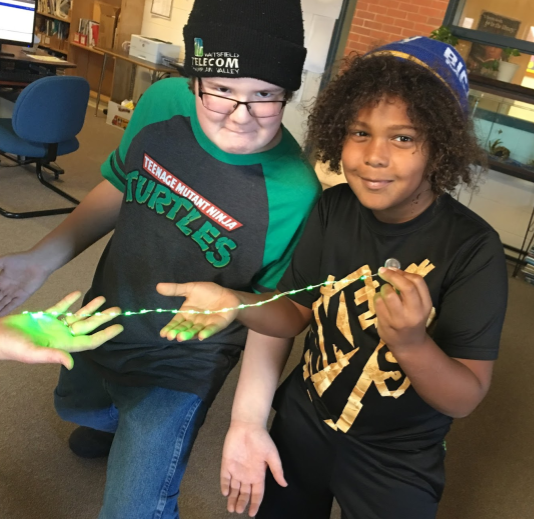 A rubric that helps students learn and notice collaboration skills, self direction, perseverance, effective communication, project management is perfect to help honor students who excel at this maker skill and help other students become more proficient in this area. At other times, craftsmanship is what you need in a maker project. The maker who has the attention to detail, the skills to move beyond the prototype and create the high resolution product necessary is what you need in the final stages of many maker projects. This is especially true when your maker project might be a gift, a work of art, or a solution that solves a real world problem. 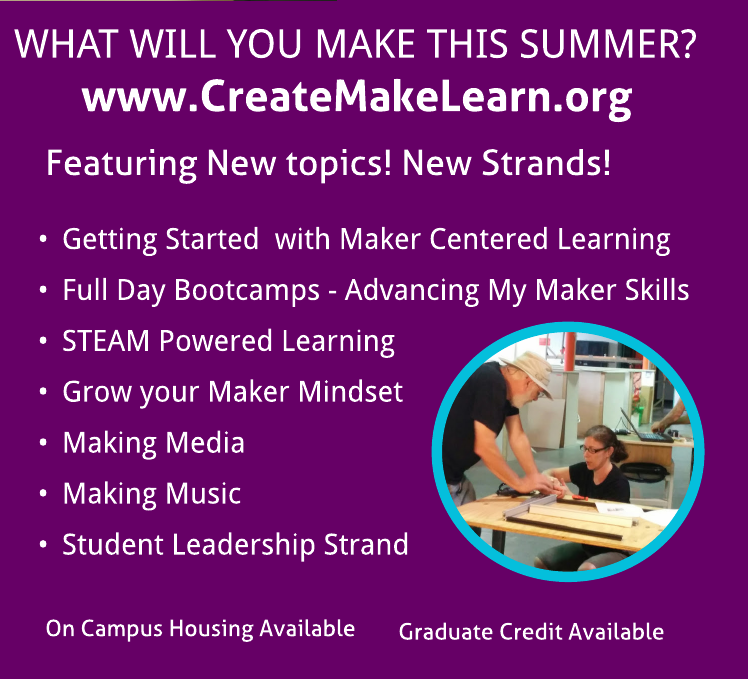 Katie really helped me believe in myself as a maker educator and to be able to name which maker skills I bring to the table. 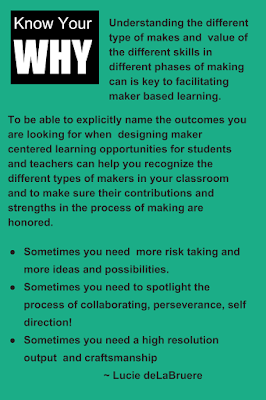 It also helped me more explicitly name the outcomes I am looking for when I design maker centered learning opportunities for students and teachers. 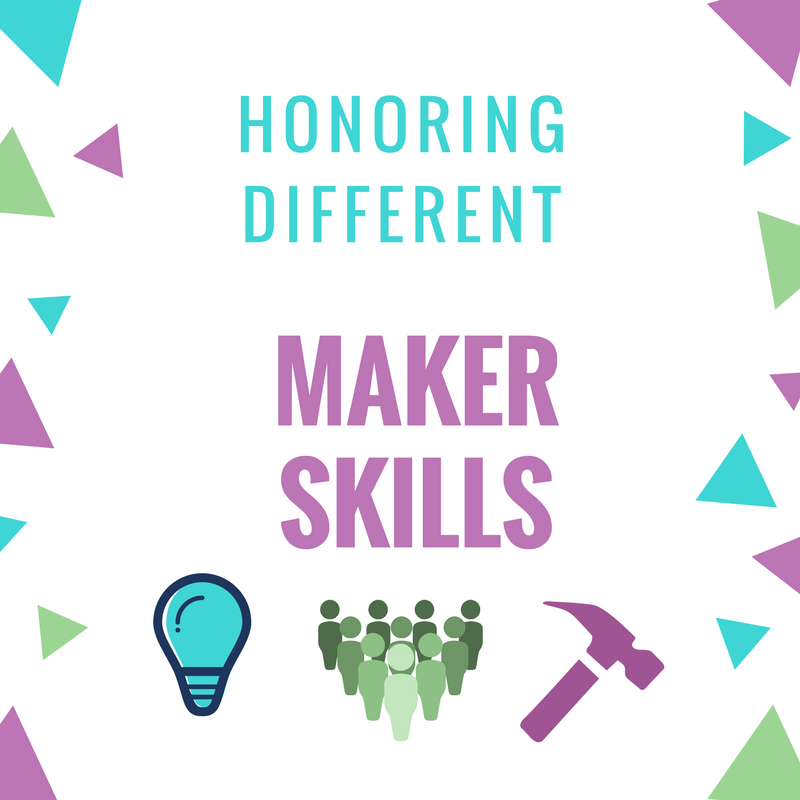 Her advice gave me tools that could help me honor the different types of makers in my classroom and to make sure their contributions and strengths in the process of making are honored.